Staff from Eaton Family & Specialty Care braved the cold and snow over the weekend to serve food at a unique community restaurant. The Bistro at Eagles Point offers affordable meals for $6 or whatever the patron can pay, and depends on volunteers to fund and serve meals. “The Bistro depends solely on volunteers,” said Christina Messenger, practice supervisor for Eaton Family & Specialty Care. Danielle Webb, medical assistant, suggested the outreach but unfortunately was sick and unable to go, Messenger said. “She is always looking for ways we can give back to our community,” Messenger noted. Four team members served from 8 a.m. to 2 p.m., she said. The weather prevented some staff from participating, though staff will definitely plan to do the outreach again. 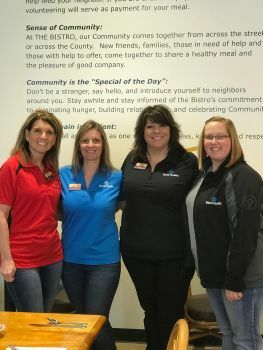 The Bistro opened in 2017 with a “pay-it-forward” mission to help the unfortunate in Eaton and Preble County. A “chef-quality” meal is offered for $6 to those who can afford it, with the option of paying more to help others or volunteering as a way to earn a meal.